We’re in the final glide path to high school graduation here, plus birthdays. We spent the weekend cleaning and gardening like crazy – and there’s still a ton to do. That means removing a frosting of construction dust from every surface of the house; unpacking and placing the remaining kitchen goods (sorting out stuff to save for future spawn-apartments, or for charitable donation); washing all the floors; replacing the rugs stowed away from the chaos; waking up the garden from winter doldrums; building the new bean trellis out of last year’s giant grass canes; planting the beans; attacking the colonizing blanket of unwelcome weeds in the flower beds; staking the peonies; scrubbing down the bathrooms (similarly affected by construction dust); and generally putting everything to order. We didn’t finish, but we put a huge dent in it all. That means no time spent on detailed photography of the new orderly and in-service kitchen, and precious little time on needlework or knitting (although I did finish the last of my stack of Birthday (and Un-Birthday) socks in time). Plus the normal weekend regimen of cleaning and cooking for the ensuing week. I am now exhausted just tallying it all up. Here is what I can report photographically. 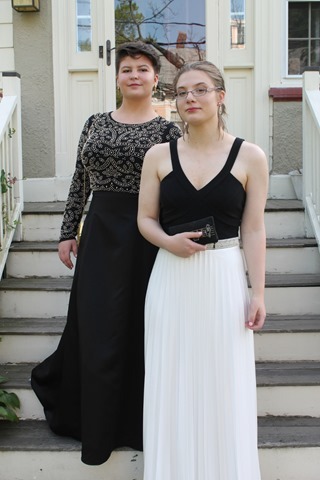 Younger Daughter and The Denizen got all decked out for the Senior Prom. The went with a herd of friends, and had a great time. And we had an amazing joint birthday cake – home-baked, of course, courtesy of Younger Daughter. 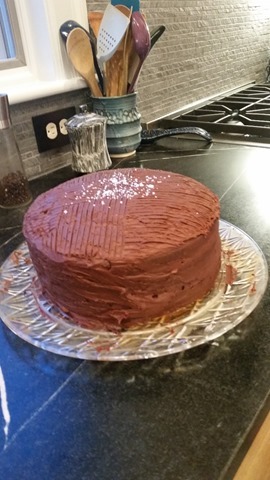 She used the America’s Test Kitchen Salted Caramel Chocolate Cake recipe in her first trial run of the new ovens. Oh, so good! We’re finally closing in on the last leg of the Great Kitchen Rehab. Cabinets are in. Appliances are in and working. Most of the drawer and cabinet pulls are installed. 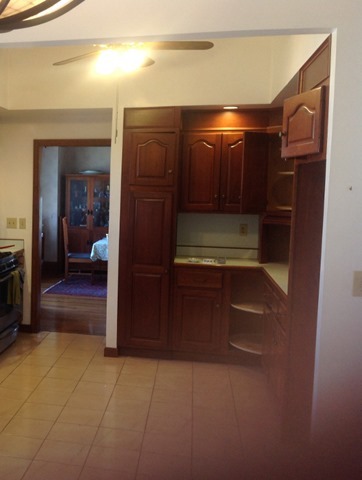 The protective covers on the tile floor, soapstone counters, and range hood are gone. All that remain are the missing pulls (the hardware order was short), a minor electrical fix on the overhead fan and its controls, final clean-up plus oiling down the soapstone, and painting. Most of the missing pulls are cup-style, as seen on the left, below. And one detail that wasn’t seen before is the leaded glass panel suspended in front of the transom window. Apologies for the odd lighting – it’s tough to get a photo of a clear window in the late evening. The backsplash extends across the entire wall below the cabinets on the sink side, and behind the rangetop, under the window and up the other side of the window (a skinny strip) on the other side of the room. The end wall surrounding the door to the dining room is bare. 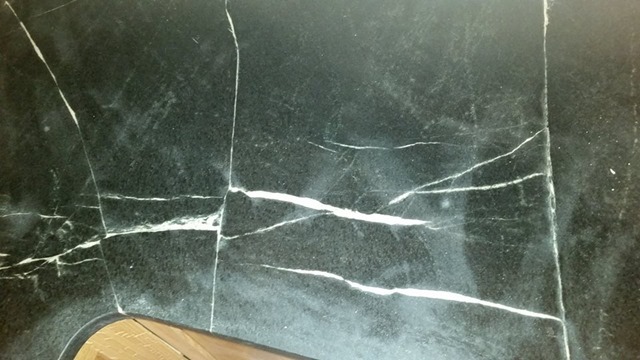 The soapstone will darken considerably when oiled/waxed. The painter should start next Monday, possibly earlier if he is available. It’s just the one room, so it shouldn’t take long. The walls are a very pale dove grey, with the now-poplar-color window, door and baseboard trim done in an enamel, one click darker. The ceiling will be white. After painting we have the next challenge – moving everything back into the kitchen, figuring out where it goes and stowing it all safely away. I’ve already ordered oilcloth to line the pull-out drawers of the pantry, so with luck we’ll avoid those sticky circles under bottles of oil or molasses, that happen no matter how carefully they are wiped down. 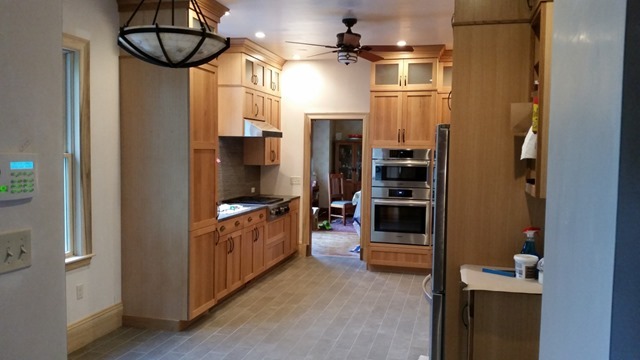 The next post on the kitchen rehab will be the last one, with everything done, plus a before and after set to finally banish the ghosts of the vaguely Colonial style cherry veneer that used to be. 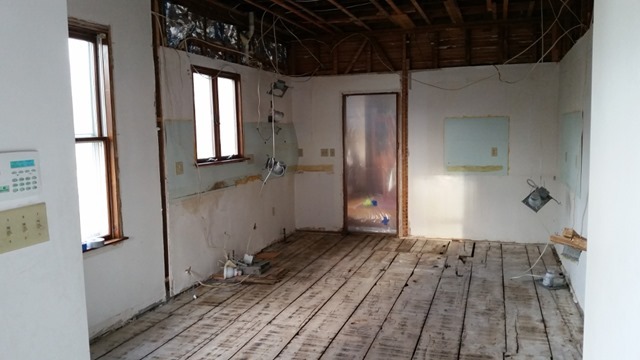 What will we cook first in our new kitchen? 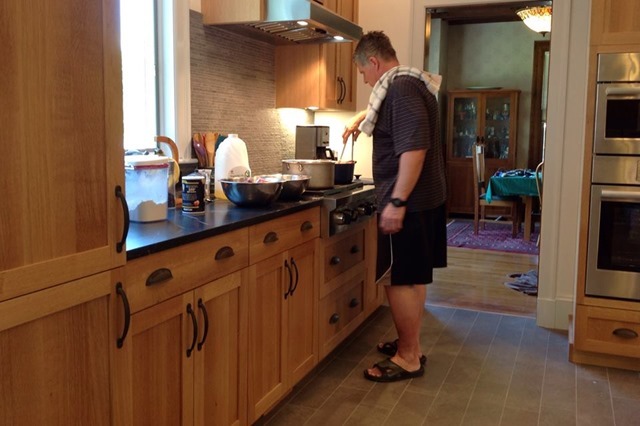 Hmmm…..
It’s been a while since the last post. Progress has been steady all this time, but it’s been incremental, with not that much that was exciting enough to show off. After all – one wall’s worth of additional baseboards or crown moldings does not make thrilling photos. But now that it’s all in I can give everyone a peek. 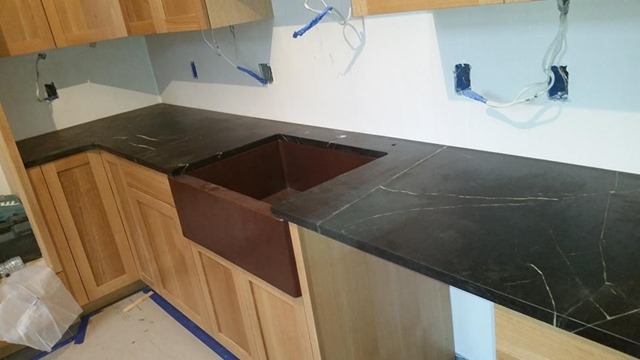 The last is first – the stone countertops have arrived, and the copper sink has been placed (although functional installation is still down the road). These pix were taken by The Resident Male, and were posted on Facebook yesterday. And here’s the main workspace under the windows, where the sink used to be. The stone is on both sides of the rangetop, also slid in but not functionally installed yet. That’s an ocean of prep space, enough for tag-team cooking and baking. There’s another small bit of stone, on the other side of the fridge (which is to the right of the dishwasher). That’s about 18 inches wide at most, and is a necessary place to plunk cell phones for recharging. Now that all of the stone is in, the next thing the team did was cover it all up with protective cardboard so additional work would not harm it. In these dawn-this-morning shots you see all of the cabinetry is now up, along with all of the crown molding, door and window frames, and baseboards. Here you see the lineup from the door to the dining room, with the opening for the wall oven and microwave next to it, past the sink and on to the big opening for the fridge (with the tiny counter just peeking out on the other side of the fridge space). 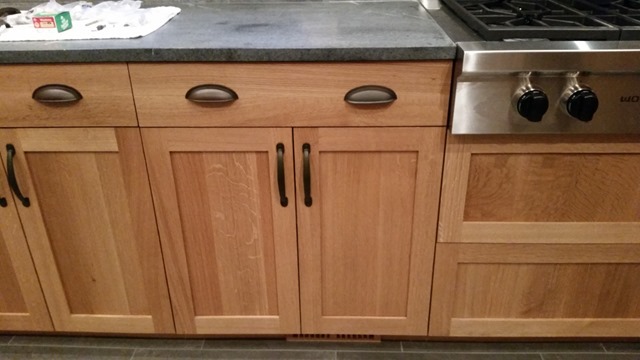 Yes, the upper cabinets are HIGH. We’ll keep a stepstool in the kitchen for easier access. Here’s the other side of the room, showing how the work area near the window flows. 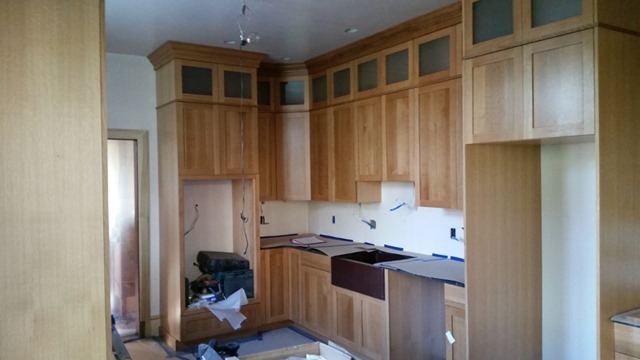 There’s a small counter area to the right of the rangetop, and on the side of the prep area you see the pantry cabinet. A real pantry with actual usable space and rolling, lipped shelves; instead of the narrow, near unusable bit we had before! Finally, here is the view back towards the kitchen door, showing the laundry area, with its folding door reinstalled, and the utility cabinets opposite the entry door. There will be a hanging bar beneath this, like there was before. 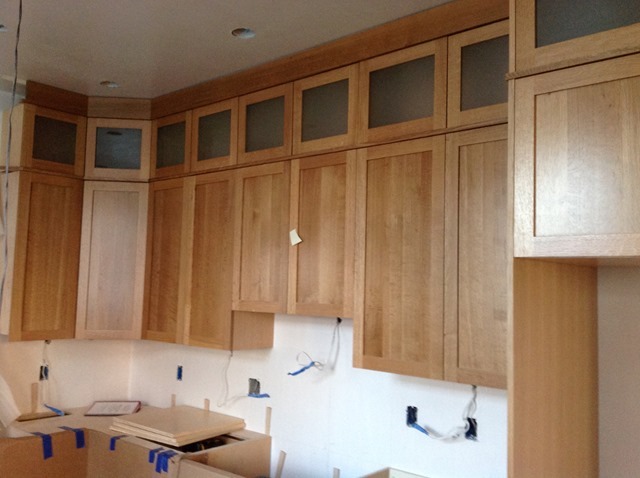 While there are upper tier cabinets here, too, they are wood front, without the glass that’s in the main kitchen area. The molding surrounds for the windows and doors are simpler than that in the rest of the downstairs, but coordinate with it in size and contour, as do the baseboards and plinths beneath the door surrounds. 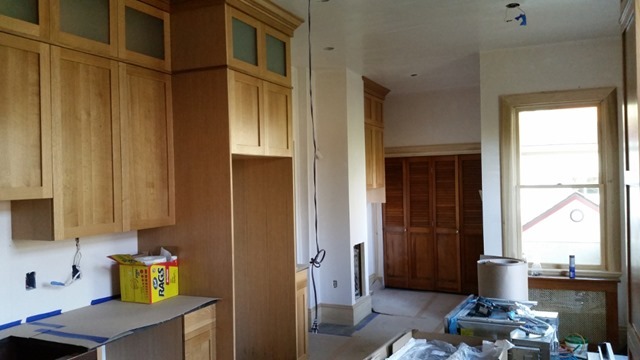 All of the pale poplar woodwork you see (doors, windows and baseboards) will be painted. 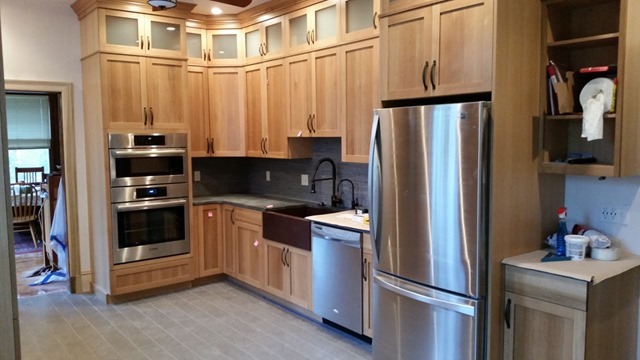 It would very difficult to match the color of the cabinets with stain. Also bring those linear elements forward would bring a heavier look to the room – very ‘70s, in fact. Instead, when we paint the remaining walls a very pale dove grey, we will paint those trim elements in a very slightly darker, glossier grey, so that they visually recede. We haven’t decided yet, but we may also paint the radiator cover under the entry way window. Not sure yet about the folding door. So that’s the progress for the past eight work days or so. Remaining work includes the tile backsplashes behind the sink and stove/prep areas, install of the ovens, all supporting final finish electrical and plumbing work including the faucet, disposal, and filtered water tap, some tinkering/reinstall of the room’s radiators, and the lighting fixtures and ceiling fan. After that comes painting. And then we can FINALLY move back into the kitchen, and cook our first celebratory meal. I am so looking forward to it! The wandering washing machine has been moved back to its alcove home. But you can see the floor. We’ve chosen 18” x 6” tiles, and had them laid out with random overlap (instead of on halves or thirds), with the long dimension aligned with the long dimension of the room. That makes the room look a bit larger, in both directions. 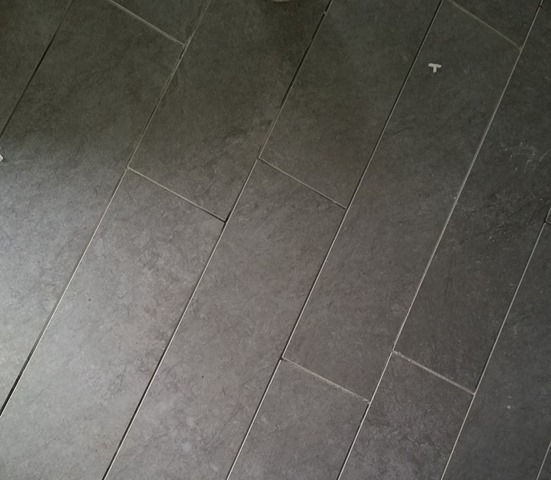 Here you can see the texture and color – it’s tile, but with a slate-like look. Protective cover now down over the new tile for the duration of construction and our cabinets have been delivered! The whole kitchen is pretty much crammed full of boxes of wood boxes. And as you can see, they’re beginning to be installed. We’ve opted for plain shaker/mission style quarter-sawn oak in a light finish. Much brighter than the dark cherry stain that was there (before pix provided for comparison). I didn’t want painted white cabinets – the other option. I much prefer the look of finished wood. The layout is changing, too. Where the useless pantry was before, will now be a microwave and wall oven (the large opening straight ahead). 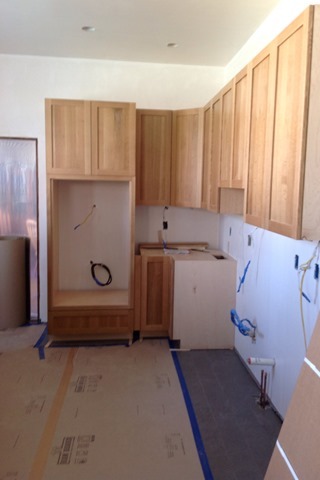 On the right, where the upper cabinet notch is, will be the sink. That used to be on the other side of the room, under the window. I’ll miss looking out the window as I wash up, but moving the sink gives us a much more efficient countertop space allocation. 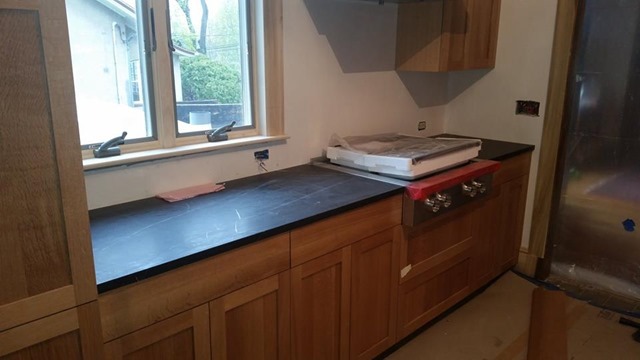 We’ll have a large prep area next to the stove. In the new layout photo above, there’s another cabinet next to the corner unit – then the sink, and a dishwasher ON THE RIGHT – no more twisty-turn to load the thing, and then the fridge. 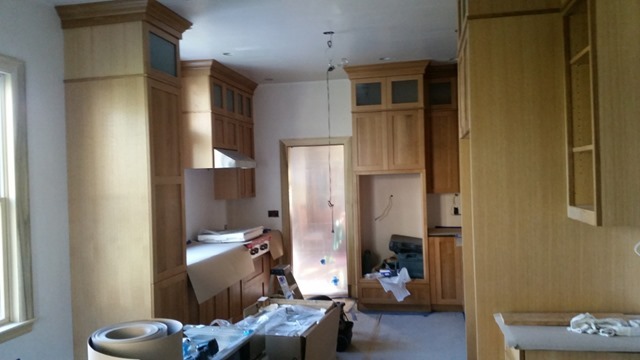 And what you don’t see is that there is a second course of small cabinets going on top of these, bringing storage right up to the ceiling. Those will have frosted glass fronts instead of the wood center panels, to make their facade less imposing. Yes, we will need a stepstool to get into those top cabinets, but they will be a great place to stow stuff we only use once a year. Next photo will be more cabinet installs, both above and on the other side of the room. 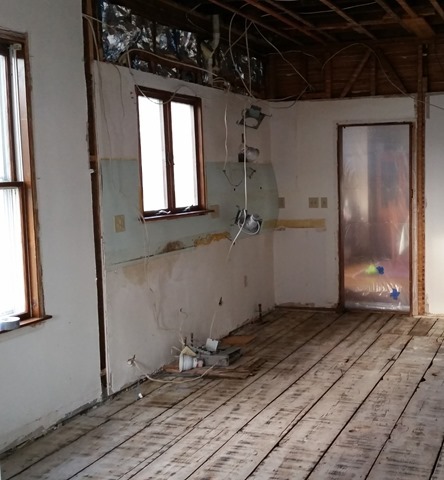 The first step will be another layer on top of these old sub-floor boards, on which the tiles will be set. 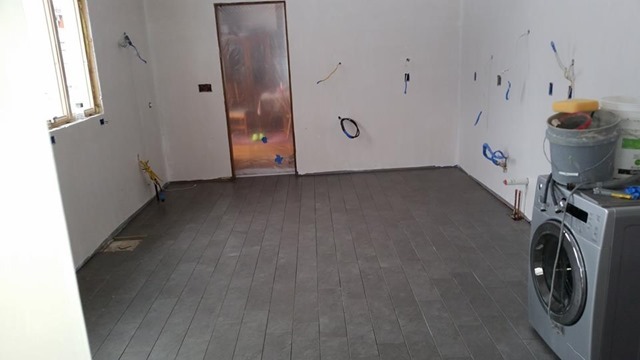 The whole install will take several days, so there won’t be all that much other progress to report until it is completed, and we have a floor again. OK. The kitchen rehab enters the beginning of the “we’ve taken it all away – now we put it back” phase. As I reported on FaceBook, those remaining walls and ceiling bits had to go. 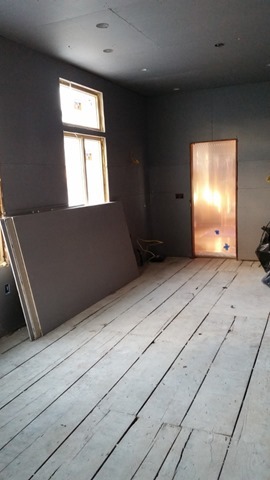 The previous homeowner, in a typical fit of doing things in the cheapest, and most stupid way, used a low grade of plain old wallboard underneath the skim coat plaster when he ripped out the original lath and plaster during his redo of the room in the early ‘80s. That means that they were not salvageable. We had not planned on taking down the parts that were not going to be modded, but we were forced to because the walls were crumbling. Oh well… There’s no such thing as a renovation of a vintage house that does not involve an Unexpected Surprise. What’s there right now looks more or less like it did when this picture was taken on Friday. All the way back to the studs that used to support the lath and plaster, everywhere (with the previous stage picture provided for comparison. 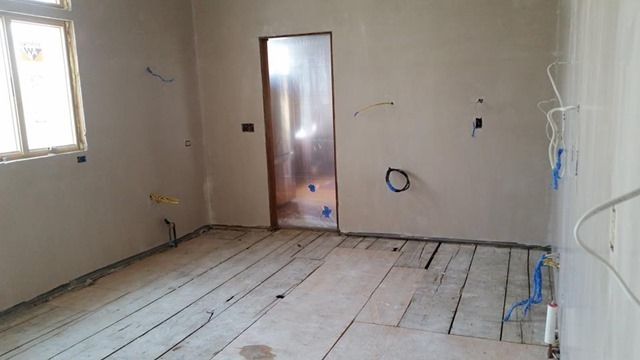 Monday the crews came back, and removed the last bit of flooring underneath the radiant heater where the sink used to be, the room radiator and washing machine/dryer – disconnecting the water lines to do so. They also roughed in the main plumbing lines. We are moving the sink from underneath the window to the other side of the room. While it’s nice to have the window view, moving the sink gives us a large span of prep counter adjacent to the rangetop, and allows us to put the dishwasher on the right hand side – much more convenient for us right-handed folk. But to do this, they had to relocate the main water and waste lines, and remove the unused components from the old location. So progress towards reconstruction has officially started. From now on in, things should start to appear, rather than disappear. Aside from the continuing drama of living in a construction zone, I did get to peel off this weekend and have some fun. 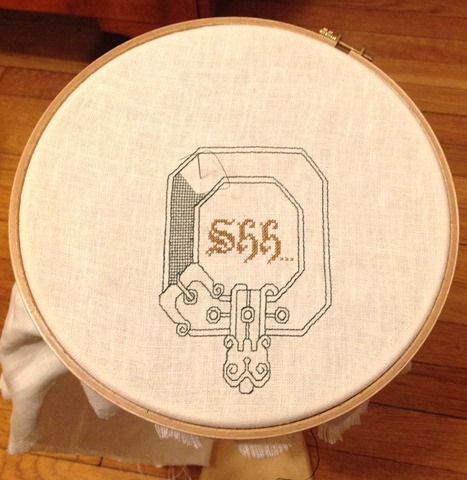 I went to an SCA event – the Hrim Schola held in Barony Beyond the Mountain, on Saturday. For my non SCAdian friends, the day was a roster of classes in technique and history, focused on needlework, weaving, knotting, knitting, and allied techniques and tools. It was held in southern Connecticut. 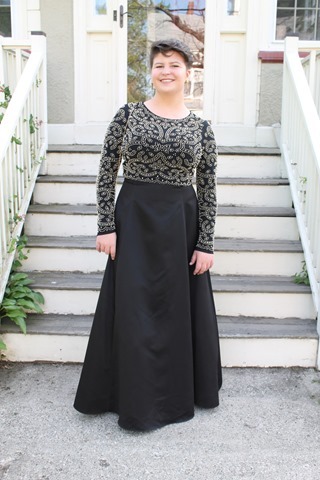 First of all, I have to thank Needlework Pal Mistress Kathryn Goodwyn (she of “too many centuries, too little time”) for providing me with a suitable dress. I have been an SCA recluse for many years, and really and truly had nothing to wear. Since the day is done in historical dress, I could not have gone without her assistance. Sad to say, although I promised to take a photo of her Anne of Brittany dress and hood, I forgot… Still, many people admired it and gave me compliments on it, and were delighted to find out that it came from her hand, so many years ago. Second I want to thank Lady Eadgyth for prodding me to attend, and to Aaradyn, Lady Ysane, and the rest of the Occasional Weekend Sewing Circle for helping me mend the gown and dress me in it (it takes a committee to do this). I had a ton of fun, learning how to do Elizabethan-era plaited braid stitch in metal thread, seven or eight variants of lucet cord (I lost track of how many we covered), and swinging a hammer to dish out a small copper thimble from a disc of copper. While I can’t swear to the efficiency of metalworking while wearing a corset, I did produce a result. The teachers of these classes also deserve copious thanks for making the day worthwhile – respectively, the talented Elaine Howys, Lady Eadgyth, and the very patient Anton Leflamme. (Apologies if honors or names are mangled). Yes, it’s more conventional to give an actual green belt rather than a representation of one, but I’ve always been unconventional. And this way she can choose the style of her belt herself, to match whatever period garb she prefers. Progress! The soffits we worried about two days ago turned out to be improvised and totally non-structural. 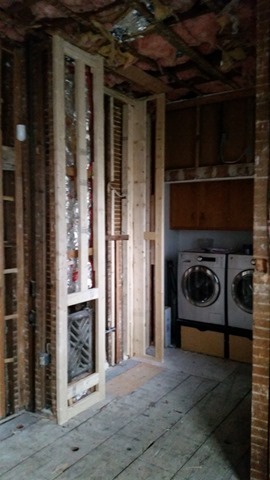 And the walls we wanted gone were similarly non-load-bearing. So they are now all gone. Our kitchen has been reduced to a bare-bones box. The awful pink tile is also gone. It had been affixed to plywood, which was mounted on top of the original oak flooring. That turned out to be too damaged to salvage, but we anticipated that – our new design includes new tile. With the old tile and underlayments gone, the new tile can be installed flush with the existing floors on the rest of the downstairs. 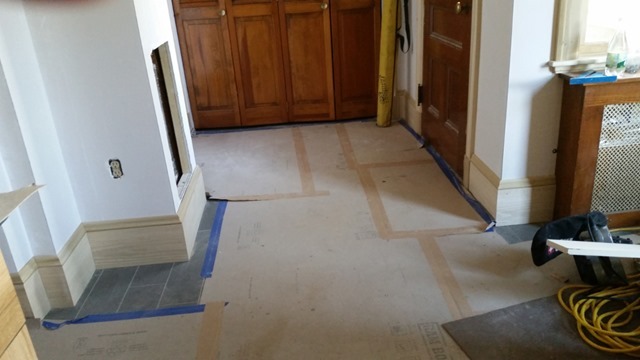 No more 3/4-inch “trip me” strips at the doorways! In terms of house archaeology, a few things have been revealed. I get a big smile from the wide-board underfloor, now exposed. You just don’t find slabs of tree like that in a new house. 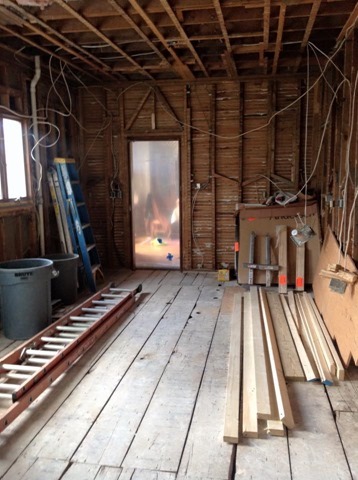 You can see the footprint of the old butler’s pantry pass-through on either side of the door to the dining room. Those cabinets and dry sink were long gone before we moved in, although the butler’s pass-through still exists in the sister house next door to us. Also harder to see, is the framing for the heat grille that brought kitchen warmth up to the bedroom that’s now Elder Daughter’s – which must have been the nursery at one time. The grille is gone from upstairs, and the floor is patched in there, but looking up at the ceiling now exposed below, you can see the frame in which the vent used to sit. 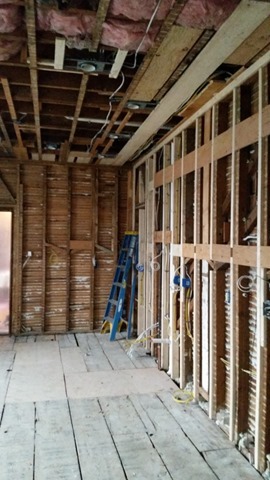 On the far wall are remnants of old knob and tube wiring. My contractor is VERY happy we have written certification that all knob and tube in the house is dead, a victim of the general house re-wire we had done when we first moved in. 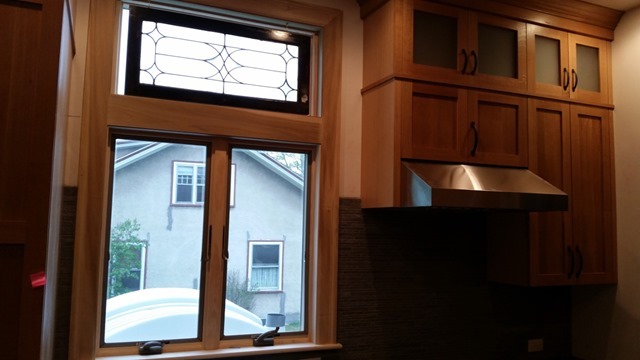 Another thing that isn’t shown well here is the framing for two windows in the kitchen, both larger than the remaining old over-sink window. We know they existed from faint scars in the stucco outside, but we still have framing for them inside. This turns out to be a good thing. The last bit of interest revealed are marks on the overhead joists, which show where the original lath and plaster ceiling existed. It was full-height – the same as in the rest of the downstairs. Having that room overhead again will make the kitchen feel much larger, and will keep it cooler in the summer. Now having almost maxed out on the Destruction Phase, we begin Reconstruction. First up today – the new windows. Four to be exact. The two in the dinette area replace the existing ones, with no change in dimension (I would have liked to make one of those bigger, but budget realism manifested). The other two replace the smaller window that is over where the sink used to be. 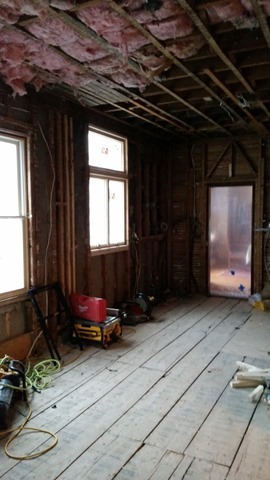 We will be re-using some of the old window framing to put in a new window plus a transom panel above it, to bring more light into the north-facing room, and to use up some of the awkward space between the window area and the now significantly higher ceiling.